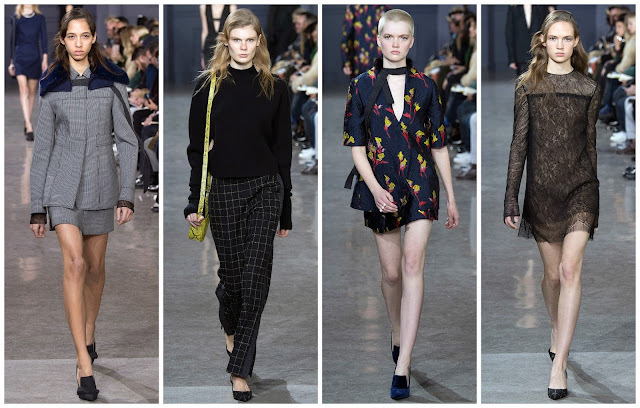 Jason Wu was one of the first shows on the agenda for day 3. His usual venue Spring Studios once again hosted the show. Last season saw a presentation of diluted daywear, Fall 2016 was a self-assured romp in the dark side. Venturing into the unknown, this darker, sexier collection proved to be Wu’s strongest to date. Newcomer Yasmin Wijnaldum opened the show in a grey coat and pleated skirt with a navy mink collar. A velvet top was styled with navy trousers, and a black coat, embellished with fur details, emerged, furthering the darkness. A zesty lemon hue took to the runway and was given a sharp taste via the navy heels. The floral prints used in this collection were beautifully done. Smeared down the body of dresses in some cases, they were like abstract paintings and some of the best work I’ve seen from Wu. Even better were the pink and mustard flowers against a navy jacquard background. Spring campaign model Ruth Bell wore a miniskirt and jacket, suitable for winter sun or summer parties. Those looks slotted in nicely, between the tonal and feather embroidered numbers. As this collection unfurled I begged the question, “why is Wu designing at Boss and not Nina Ricci?” This collection was—a strong—take on Parisian dressing through an American lens. That appointment will come, I’m sure of it. Between now and September, we can revel in the beauty of this collection. With only three days under our belts, some New York collections are making up for the shambles that was last season. 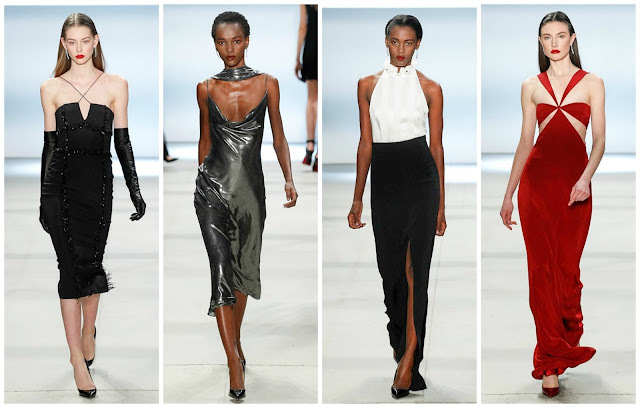 This blend of Jason Wu and Elie Saab would’ve benefited more from ideas core to the Cushnie et Ochs brand. I truly believe that would’ve amplified this collection, a blend of surface decoration with a mixture of textures. The show closed with a flaming red velvet gown with side cutouts. This is the Cushnie et Ochs staple that this collection needed more of. 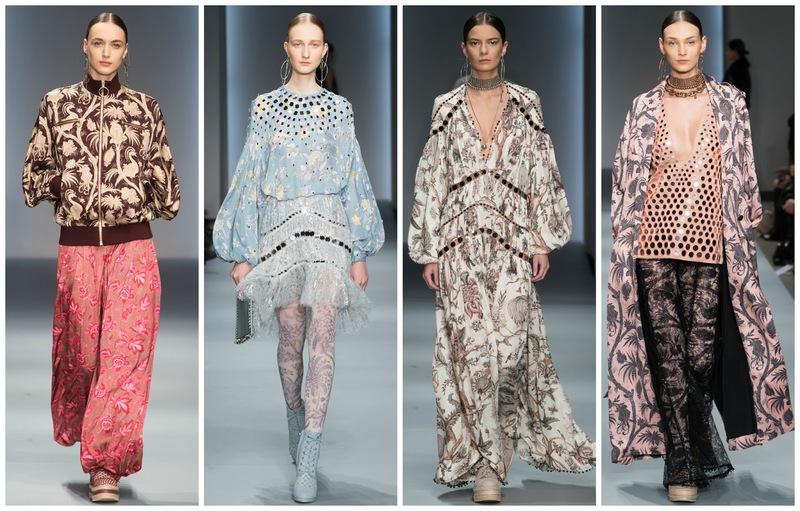 Australia’s shiniest export, Zimmermann showed their newest collection on a jam-packed Friday schedule to much acclaim. India and it’s vibrant colours inspired the show. Like Mary Katrantzou in London, Nicky and Simone Zimmermann are purveyors of surface decoration, a talent they’ve excellently honed in throughout the years. This was a continuation of that. There was floral-printed satin dress with bulbous sleeves featured a low neckline and was paired with matching tights and lace-up booties. Gold cuffs, a choker and earrings also accompanied the look. A flowing gown in rose gold looked like it had borrowed inspiration from Allen Jones’ iconic bodysuit seen on Kate Moss a few years back. A pink, embellished chiffon gown is fit for any summer wedding. There wasn’t a moment of silence in this collection. We went from vivid florals to metallic lamés and pailette embroidered to shiny lace. Everything here was saleable. The Australian customer will undoubtedly lap this up. The Victoriana-tinged gown in subdued hues, though fuelling the excess of prints, stood out as the best of a positively pleasant bunch. When Mary Katrantzou focused on tonal pieces a few seasons ago, her collections became more powerful. Hopefully this bright duo take a leaf out of her book and find comfort and beauty in the simpler things. Comparatively, Fenty x Puma was a smaller affair than Yeezy Season 3 (in collaboration with adidas). Kanye employed thousands of models to stand for an hour and a half. Rihanna opted for the fleeting fashion show and it certainly paid off. There was a surplus of the “rebellious swagger” that Jeremy Scott spoke about front row. Presentations are all the rage, but a catwalk show is much more powerful. With top models such as Imaan Hammam, Lexi Boling, Gigi and Bella Hadid walking, the witchy, street wear glam with religious undertones was delivered in a fast-paced manner and it was the embodiment of the creative director. Rihanna’s personal style is visible in this collection throughout. From the opening look, a just a hoodie and thigh high lace-up boots to the daring evening dress, a round neck gown with a flesh-bearing opening that was laced-up. An off-the-shoulder satin jacket with wool lining had Rihanna written all over it. This collection, albeit with grungy flairs, encapsulated the broad reference points of Rihanna’s chameleon style. White and black trees were dotted around the set. Plumes of smoke filled the runway and Lexi emerged, lips kissed black, swaggering. These sinister witches had their hair caked in white spray-on dye, permeating a macabre vibe. Warlock’s too; there was an impressive line-up of menswear too. Hoodies, boiler suits and repurposed trousers. Most things were oversized, deliberately allowing to blur genders. 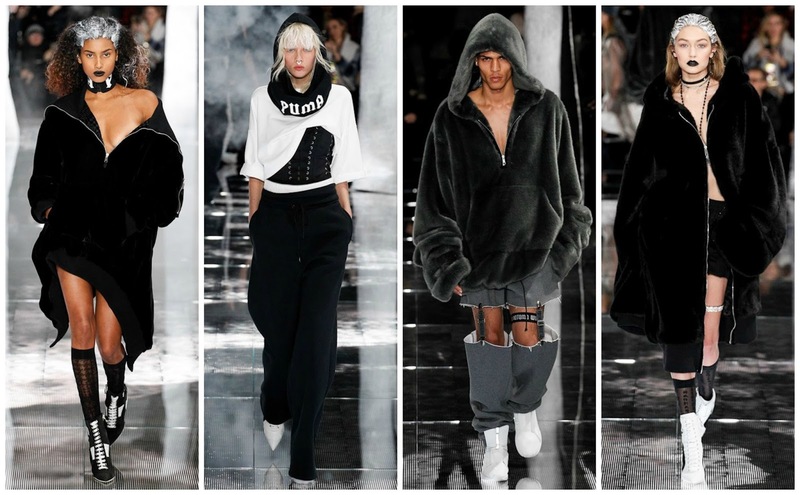 This was inspiration from Vetements, Hood by Air, and Alexander Wang, all of who's presence was felt at the show. As creative director of Puma, Rihanna is overseeing the movements of Kering’s largest sports and lifestyle brand. The favourable sales speak for themselves, but the general vision of the brand is enlivened by the Barbadian singer. It wasn’t just the shoes that will perform well and look great this fall, the clothes are great too.